Tha Gyar Min, please appraise my good deeds! You are in Home » Only in Myanmar » Tha Gyar Min, please appraise my good deeds! During my childhood life, my mother liked to bring up a story of Tha Gyar Min (သိၾကားမင္း) when I did something wrong. She told me that He will record every good and bad deeds that human commit. “Son, don’t you do bad things even when nobody’s around. In fact, you’re actually never alone; Tha Gyar Min’s always there to keep an eye on you”, said my mum with her finger pointing upwards. Who is Tha Gyar Min and where is he from? Legend has it that Tha Gyar Min is the King of celestials who is very close to us human beings. Some claim that He has its root of story in Hindu mythology, not Buddhism. 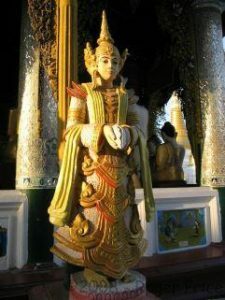 With the influence of Hinduism on Buddhism, we Buddhists take the belief of Tha Gyar Min as one of our Buddhist deities and that makes him play much role in our traditional belief. To us, this celestial body is regarded as a custodian of Buddhist culture and a guardian deity who observes if people live their lives morally and in accordance with Lord Buddha’s teachings. In our belief, there are six tiers at the abode of celestial beings and Tha Gyar Min lives in uppermost layer of abode. Living in the highest tier means he holds the highest hierarchical power among other deities. You can see the statue of the deity in every pagoda. Most of the legends about pagodas are simply associated with Him. 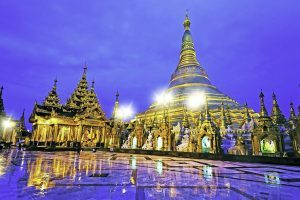 The legend of our famous Shwe Dagon Pagoda has it that Tha Gyar Min helped the King Okkalapa with the enormous and majestic design of the pagoda while the king was having it built. Therefore, it’s believed that Shwe Dagon Pagoda was half-created by Him and the other half by men. This is an example of how the belief of Tha Gyar Min persists in Burmese thoughts and way of life. Most of the statues representing Him hold a conch shell that symbolizes his presences to human. Every family warmly welcomes Tha Gyar Min at this time. According to the tradition, we welcome him by presenting Ah Tar O:, a small pot of Eugenia leaves. Some households decorate Ah Tar O: with various kinds of flowers. Some even use a silver pot to show appreciation of his presence. 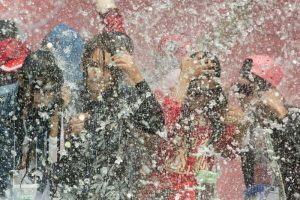 On a Burmese traditional calendar, there are four days in New Year water festival which includes A Kyo, A Kya, A Kyat and A Tat. All these days are actually related to this deity. ‘A kyo’ means, the day to welcome Tha Gyar Min, ‘A Kya’ means the day of his visit, ‘A Kyat’ means the day he makes records and finally ‘A Tat’ the fourth and last day of Thingyan festival means, the day he leaves. Now you know how He plays an important role in our tradition. He is the great king of celestials as well as the guardian of all good things and righteousness timelessly. Due to our faith and belief in his spiritual power as a deity, people pray and make alternative wishes for good things and luck to happen in life. If you ever have a chance to visit Myanmar, don’t forget to hail this great deity and try to make a wish.